Here is an easy recycled bag project to make a mini kitchen scrubber. All you need is a small amount of yarn and about 3 plastic lettuce nets. I just save the green plastic nets that my lettuce comes in from the grocery store. 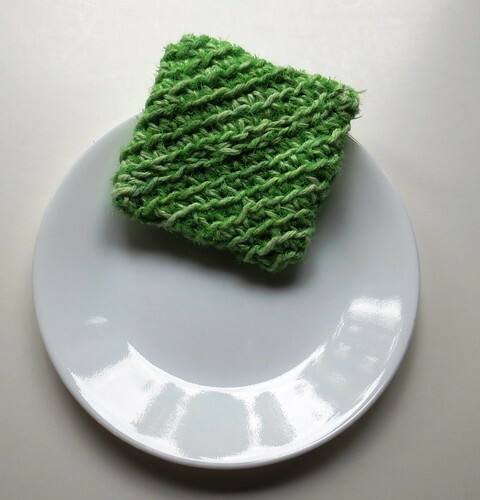 This simple scrubber is made by crocheting the recycled plastic diagonal scrubbie pattern. 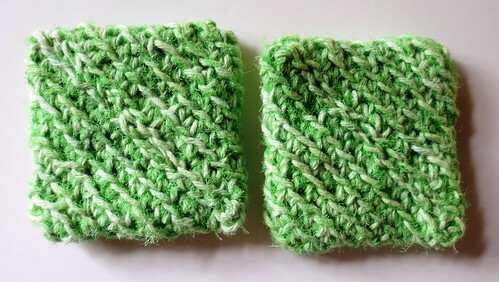 Here are some 4 inch wide diagonal scrubbbies I crocheted using recycled green produce nets. These are soft plastic nets that I purchase lettuce in at my local grocery store. 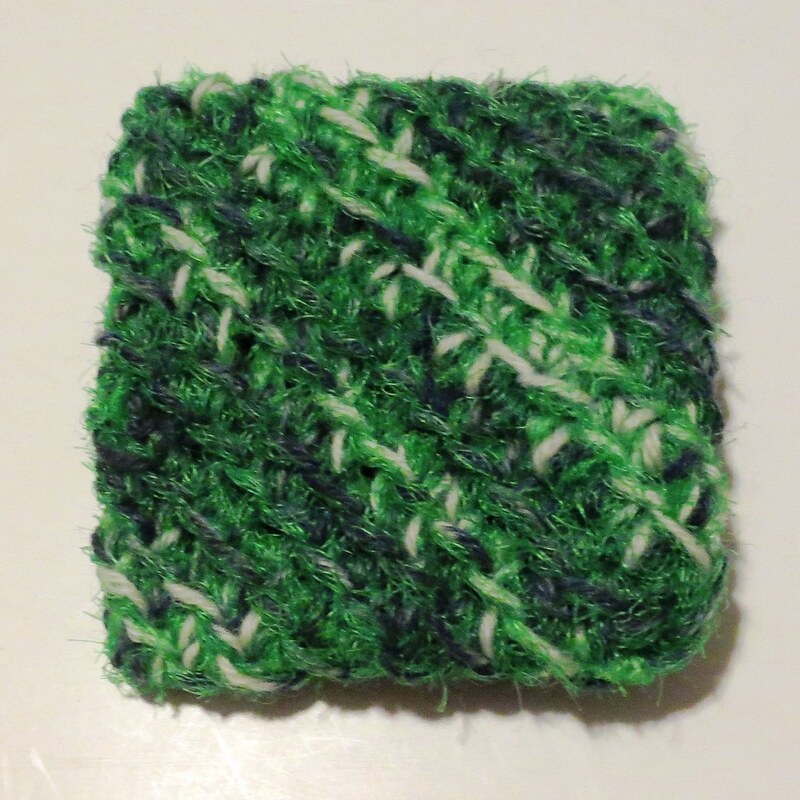 Here is the diagonal crocheted scrubbie pattern that I use to make the scrubbers. It only takes 3-4 plastic nets to crochet each scrubber along with about 1/2 ounce of cotton yarn. The nice thing about these little scrubbers is that they are sturdy enough to scour your pans and soft enough not to scratch non-stick surface pans. Plus it is a wonderful way to recycle the netting and repurpose them into something useful. I love doing some Christmas in July projects. 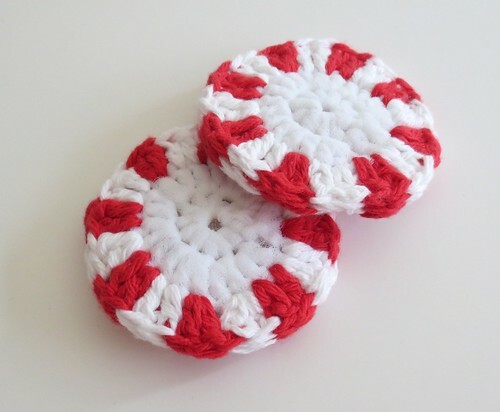 Here are some quick and cute peppermint scrubbies you can crochet that make wonderful little Christmas gift ideas. Of course I had to make some using recycled plastic bags. 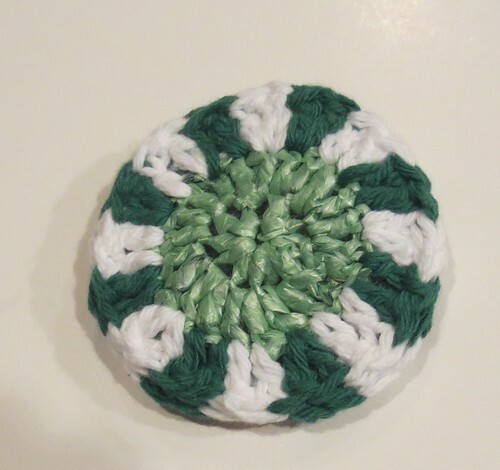 Here is a crocheted scrubbie with a green plarn center made from a thin cut plastic bag. I used one green plastic bag cut 1/4 inch wide to make the center and used cotton to finish it. Just follow the pattern directions but use the thin cut plarn for the center portion of the pot scrubber. Here is one more group of peppermint scrubbies I crocheted using different bits of cotton scrap yarn. Have some produce nets that you wonder how you can recycle them? Want to reuse them in a handy and useful way? Well how about crocheting them in a useful scrubber pad. Here are two scrubbies I crocheted using the plastic produce nets that lettuce and other veggies come in from your grocery store. Most of my produce nets are green but I have been given red, yellow, and orange colored ones from friends. The nice thing about using the recycled nets is that you don’t need but just a few to crochet a nice kitchen scrubbing pad. I crochet the nets along with cotton yarn to make a soft but firm textured surface. You can use these scrubbers in the sink and bath tub without fear of scratching the surfaces. They also can be used on Teflon pans that have non-stick coatings as they are soft enough to not scratch the coated surfaces. Depending on the size of scrubber pads you desire, at most you need 3 to 4 nets cut into strands for the larger scrubber shown. You join the strands together as shown in my produce net-cutting tutorial to create a recycled netting “yarn.” You then crochet the scrubbers using the netting yarn held together along with a strand of regular cotton yarn to make the scrubbies. I participated in a swap called envelope of doom over at Ravelry. The swap involves sending your partner an envelope filled with items that you don’t know what to do with or don’t need. Our group on Ravelry is a group of crafters that enjoy creating treasures from trash. So the goal with the envelope contents was to make useful things from items received. 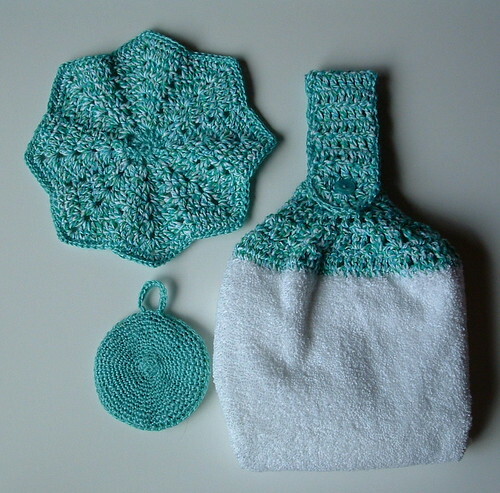 I received some pretty teal colored yarn in my envelope which I used to crochet this kitchen set. 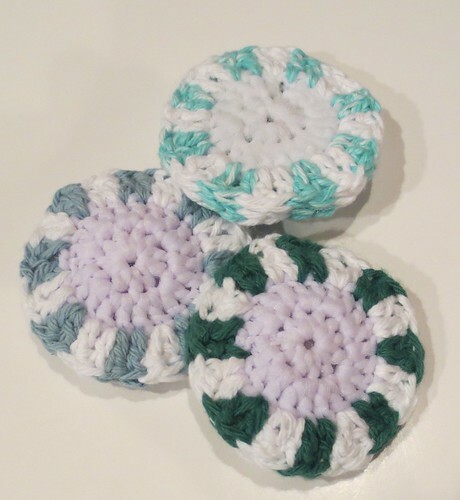 I crocheted these scrubbies using recycled plastic bags that were cut into plarn. It reminds me so much of sea coral that I just had to call the scrubbers scrubbie coral. The inspiration for these scrubbies came from my friend Kristy who shared her cotton scrubbies at her blog Texiles4you. People ask me all the time about the amount of plarn created by each plastic bag and while it may differ with one type of plastic bag to another, I found the standard white retail bags yield me about 7 yards of plarn when cut them 1″ wide and assembled using the looping method. The orange plastic newspaper bags provided me with 6 yards due to their smaller size. With that in mind, you need 4 plastic bags to make each one of these scrubbies. 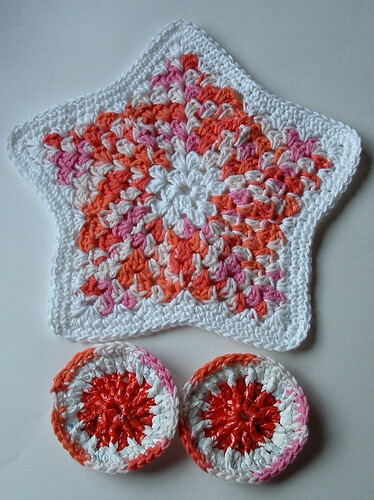 The white scrubbies were crocheted just 4 rounds. I found I liked a bigger scrubbie so I crocheted the orange one five full rounds. By crocheting 5 rounds you use all of the plarn created from the 4 plastic bags where the smaller scrubbers only use a little over 3 bags. You will find as your crochet each round that it begins to twist which is normal. The more rounds you crochet, the more twist you get. Have fun with the colors and mix and match them. I plan to crochet more of these scrubbies and add a different color just on the final round which should create an even more unique coral look for the scrubbies. Ch 2 and work 8 Sc in the 2nd ch from hook. Do not join and continue working in rounds. Use a stitch marker if necessary so you know where each round starts. Work 2 Sc in each st.
Work 3 Sc in ea st.
Option: For a smaller scrubbie, crochet just 4 rounds. 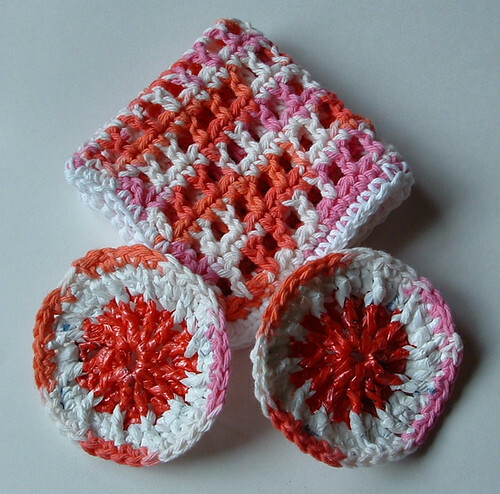 Here are a few dishcloths I crocheted along with some recycled plastic bag scrubbies. I purchased this large clearance skein of Bernat cotton yarn and have been making kitchen sets with the cotton. I crocheted the plastic scrubbies and then added a final round on the scrubbies using the cotton so it matched the dishcloth. To the right is my star dishcloth pattern but I did the two final rounds by working Sc’s in each stitch and 3 Sc’s in each point of the star. I thought by working the last few rounds in single crochet with white cotton yarn that it added a nice finish to the dishcloth. The scrubbie dot pattern was adapted by using plastic bags cut into 3/4″ wide strips to create plarn and then using a “J” hook, I crocheted the pattern as written except for the final round which I used the cotton yarn to match my dishcloth. Here is my open mesh magic dishcloth pattern using the same cotton yarn. The scrubbers were again plastic bags with the final round done in the cotton yarn to match. 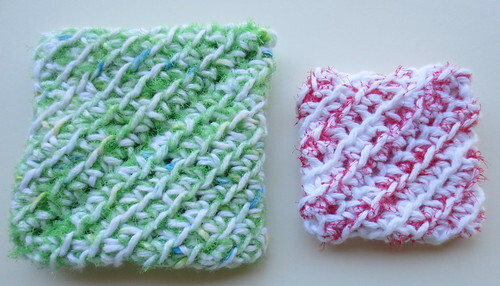 So if you want to crochet some recycled plastic bag scrubbies, consider adding a final round of cotton yarn to them so they can match the dishcloth to create a unique kitchen set. These make excellent eco gifts and people really find the scrubbies handy. Here are my colorful plarn scrubbies I crocheted using Doni’s scrubbie dots pattern. I used a “J” (6 mm) crochet hook and followed her pattern instructions using recycled plastic bags cut about 3/4″ wide as shown in my plarn-making-tutorial. The finished dimensions for my scrubbies are 4 inch wide if you follow the exact pattern directions but use plarn instead of cotton yarn. I just love this quick and so cute pattern. The nice thing about these scrubbies is that they only take about 2 colored and two white plastic bags to crochet each scrubbie. If you are like me, it’s hard to get colored bags so this is the perfect recycled crafting project to use those uniquely colored bags. I’m excited to share a little project that I have been experimenting with. You know those little green netting sleeves you get your lettuce in? Well, I’ve been trying to think of a good craft recycling project that I could do using the netting. Here is my result. It is an eco-friendly greenie that you can scrub your dishes with. The cotton with the recycled green netting is very scratching and works well as a scrubbie. It measures 4-1/2″ by 4″. 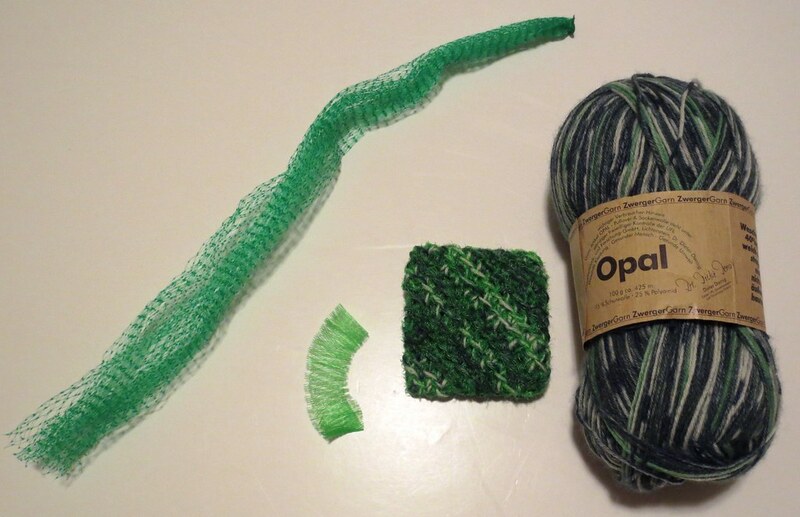 Here is a mini tutorial on the prep for the green netting bags. Lay out the green netting bag and I used a paper clip to hold the end closed.